WHY IT RATES: One of the largest planes ever built was successfully tested, moving it closer to becoming a travel reality.—Donald Wood, Breaking News Senior Writer. Stratolaunch Systems Corporation, founded by Paul G. Allen, successfully completed the first flight of the world's largest all-composite aircraft, the Stratolaunch. 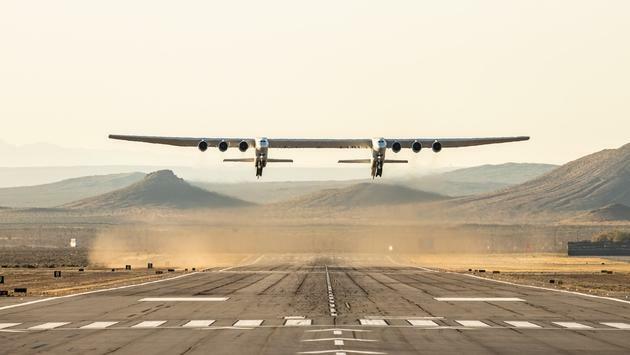 With a dual fuselage design and wingspan greater than the length of an American football field, the Stratolaunch aircraft took flight at 06:58 AM PDT from the Mojave Air & Space Port. —Performed a variety of flight control maneuvers to calibrate speed and test flight control systems, including roll doublets, yawing maneuvers, pushovers and pull-ups, and steady heading side slips. —Conducted simulated landing approach exercises at a max altitude of 15,000 feet mean sea level. SOURCE: Stratolaunch Systems Corporation press release.